Saan Ecker is pictured here with Thowra and Nadia. "The Bicentennial National Trail is a 5,330 km. continuous route down the Great Dividing Range of eastern Australia. It is a trail designated for self reliant, non-motorised trekking. 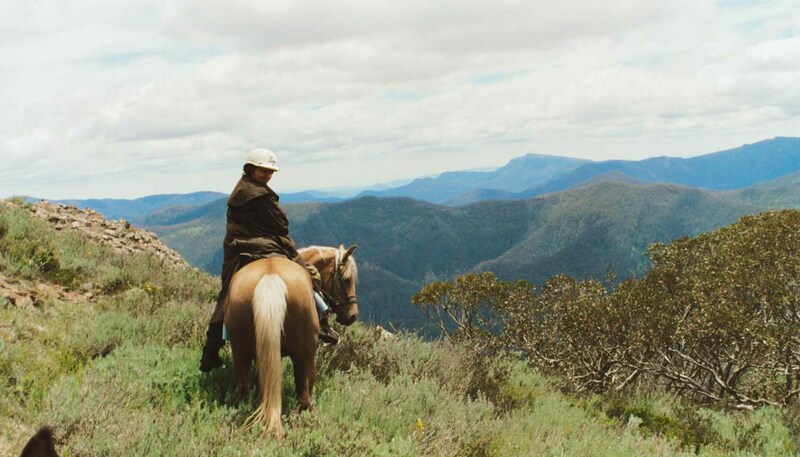 It is an opportunity to experience the remoteness and natural beauty of the landscape as the trail works its way from northern to the southern extremities of Australia. The Trail is designed for people to enjoy and appreciate a pace of life far removed from the rapid and stressful modern lifestyle. it is an opportunity to recalibrate your values in a rapidly changing world. This Trail is very much an individual experience. It is not an organised event but a trip you plan and undertake in your time, in your way." Click on picture above for detailed map of route taken from Healesville to Omeo. Australians Saan Ecker (with her horses Nadia and Thowra), Pam Brookman (with Lolly and Tumby) and Angie Grusauskas (with Shandy and Jack) left Healesville, Victoria, in December 2001. These brave women plan to follow the Bicentennial National Trail as far as they can. The Long Riders' Guild has just received an email from Saan. Nadia, Thowra and I got to Canberra just after riding around 1500km from Healesville near Melbourne. In Omeo, Thowra was fascinated by an echidna we met and I had to drag him away to stop him from upturning the echidna with his nose. 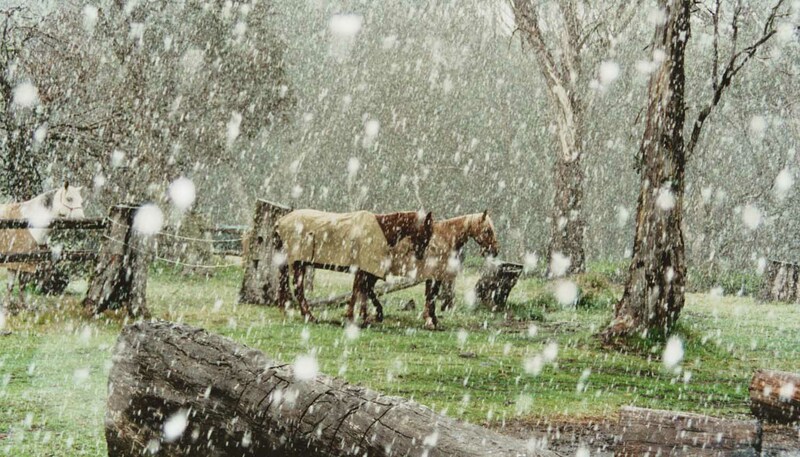 From there, I went to Khancoban, a strange Snowy scheme town and we rode on from there into the Snowy Mountains, through the Alpine National Park across the Tooma and Tumut Rivers and up to the sci-fi named Providence Portal at Lake Eucumbene. About the biggest man made river in Oz, its construction involved drowning Old Adaminaby town over 40 years ago. People we met were still grieving about that. We had our first mishap of the journey with the horses bolting about 2km. 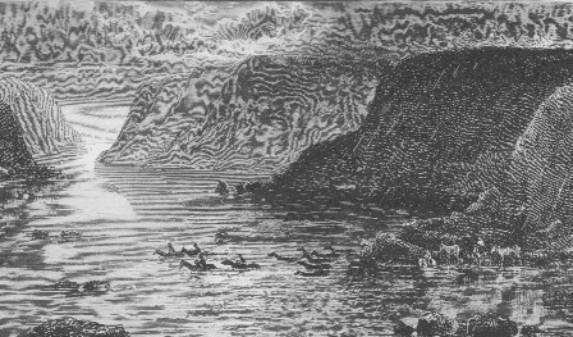 It had been bucketing rain for days and we were thoroughly drenched and cold and on edge. (Its been a non-summer in this country). A pushbike appeared from nowhere and spooked the horses. I didn’t find this out till later as I was on the worst culprit who just took off. I had decided to ride Thowra and let Nadia carry the packs. I was riding him in a halter because he’s usually ridiculously serene. Pam’s packhorse was in front galloping as fast as she could and Thowra refused to stop until we got in front. The rest of the team of horses slowed down, figuring that this wasn’t right but these two, and I as the unwilling passenger, just kept going. We were going flat out with mud and stones flying in my face as we weaved around and through puddles and trees. It was bloody awful, and staying on took all my concentration but I did reflect later that I would have had to pay quite a bit for this “man from snowy river” ride if it was at Disneyland… We stopped eventually and no-one was hurt. As a result Thowra is still on probation. I split from Pam and Angie in Canberra and they went on ahead. Nadia’s back was too sore to go on and I sought advice from several horse and saddle experts in Canberra. 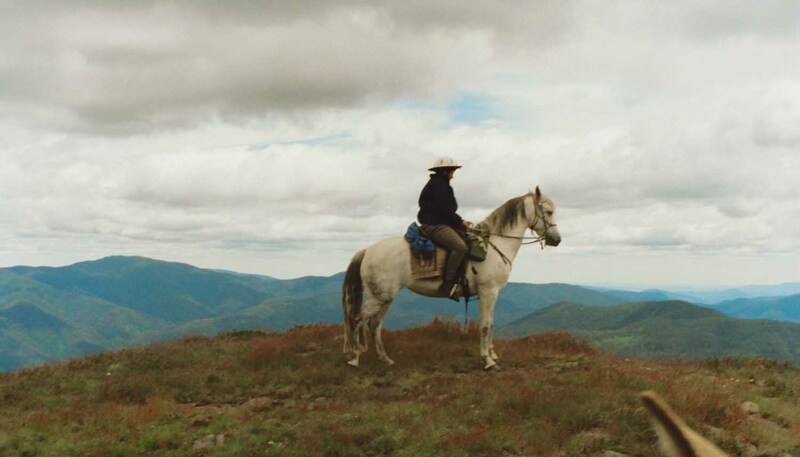 I eventually found Roy Amos who is a pretty remarkable bushie who spends much of his time researching saddles and horses, and the rest breeding endurance horses, running mare and stallions free in rugged mountain country. He turned the saddle fitting I'd had done in Adelaide upside down, encouraging me to sell my riding saddle (a stock saddle too large for both me and my horses) and get a different one (an Isobel Worth dressage saddle made to fit perfectly) and totally remake my pack saddle. He also found me another horse so that I could go on and leave Nadia to heal and recover. So Zac, the nervous endurance horse has joined the team. He’s a brilliant little horse and Roy reckons he’s Qulity (Australia’s big endurance race) material if only he didn’t have panic attacks. Hopefully some time on the trail will give him the confidence he needs. My partner Deb joined me a couple of days ago and the new arrangement will head off for the Blue Mountains near Sydney for the last leg of this journey…. I've worked out that this is just a trial run. Now I've figured out how to do this, I’d like to go on a really big trip." Pam has also sent us an update from Oberon. "As Angie and I were eating our tea in the dark Tumby started to roll more than was usual for just an ordinary scratch! Panic! He didn’t seem to be in any real pain but suddenly all his skin wrinkled as if someone had sucked his insides out. His face looked like one of those horrible old man masks kids wear to scare people. All underneath around his girth area and between his legs the skin all folded. All I could guess is that he was having some kind of allergic reaction and all I could think of doing was throwing water over him. After half an hour or so he looked a little better so I just led him round in circles as he looked so miserable when he stood still. He then started shaking so I covered him with rugs until I took his temperature, which was 40.5! Off came the rugs. After what seemed forever, but was probably 2 hours he seemed to look normal again and drank some water and started to eat. His temperature was still over 40 but by morning was OK. Needless to say I didn’t sleep the rest of the night. Having that satellite phone was a great help as I could ring my vet Harry Frauenfelder back in South Australia for advice. I got through to Harry just as Tumby started to appear normal again and he confirmed that he had had an allergic reaction to something he had eaten. What it was, we will never know. Top of the list is some very less than ideal hay they had in the last few days or possibly a death cap mushroom accidentally eaten. The next day we made a navigational error. It was very easy to do as the track we were meant to take was very faint and for a while all the directions fitted the track we were on! However after 2 hours or so there should have been a plain on our left not thick forest! Out came the GPS! For a minute or so I had a silent argument in my head with the GPS. It told me I was nowhere near where we were meant to be heading and worse still, we were heading south when I was sure we were going north! From where we currently were it was quicker to miss the campsite we were heading for and go to the following day's campsite. Angie and I finally managed to drag ourselves away from the pleasures a city offers (beds with thick mattresses, showers, toilets, fridges, washing machines, electric stoves and electric kettles and fresh food...) and hit the trail again after a week. 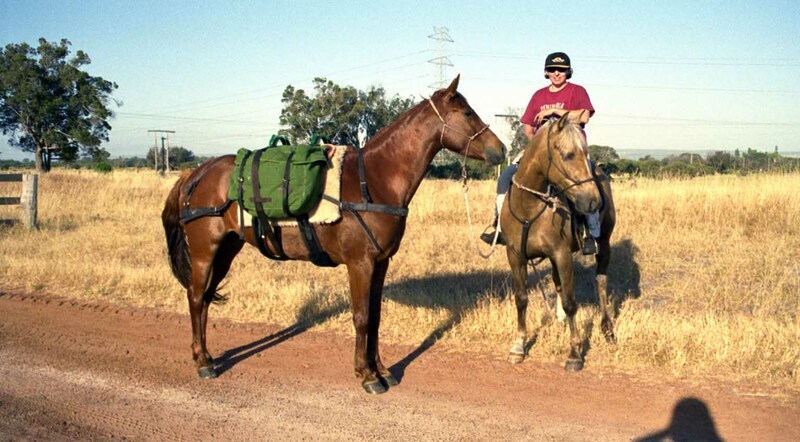 In spite of their rest the horses still had a cough, and for the first time their backs were showing some soreness so Angie arranged for her friend Rick to come and be a back up driver for a fortnight form Gundaroo to Oberon. It is going to be tough to get going from Oberon now, as no longer will we have all our meals cooked, fire lit plus damper and hot tea provided about 11.00am in the morning along the trail! On top of this a cold beer when arriving at the campsite followed by wine and port as the evening progressed! Angie and I both say we only took this action in the best interests of our horses’ health. I still have not estimated where we will get to by mid May when I will need to return to SA, all I know is it seems to be coming round far too quickly." "How can it be snowing? This is Christmas - in Australia!" "The views are out of this world." 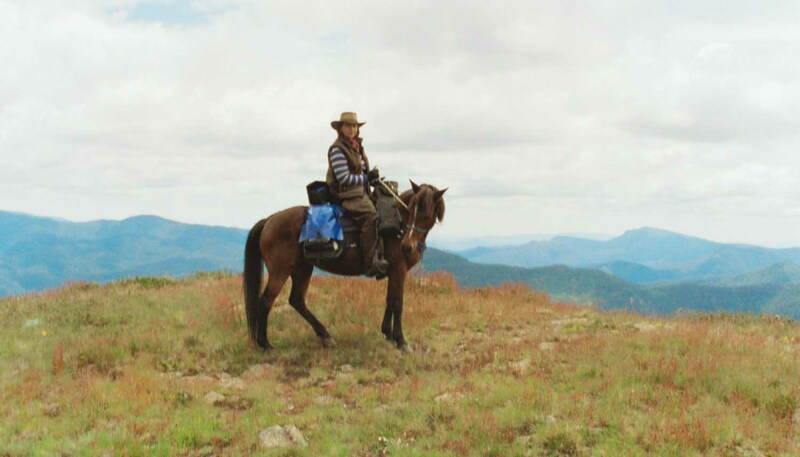 The Long Riders' Guild has received an email from Pam Brookman. "My horses and I have returned to SA. They are contentedly grazing in the paddock and I'm off to work to save for the next trip. I feel just so privileged to have had such a wonderful experience over the last six months and to have had the opportunity to meet so many wonderful people who have become very special friends. Angie and I covered 1770 kilometers before we stopped just east of Armidale in NSW. After living out of just two packbags I couldn't believe all the junk I had in my house, so I have cleaned every cupboard and taken trailer loads of gear down to the local Salvation Army depot! Now that I have a little more time to sit at the computer, I have been pouring over your updated website, which is really great." Thank you for the compliment, Pam! And there is nothing like a horse trip to show people exactly how much rubbish they have accumulated. The more you know, the less you need.